crosses the field slowly with her two grandkids. touched, but could not possess. I fear nonexistence. Today I saw cows in a field of yellow flowers. sleek horses on the other side of the road. Music takes me back. What is it I long for? Past midnight a glowing stop sign resembles a face. Turned down for a job…I am back at this computer. I think about my guitar. want to carry the passengers in my arms. Later on, I find out it was our black neighbor Henry. I go out into the darkness to shake his hand. My country makes detainees believe they are drowning. dark trees and a few street lights…but no stillness. the house…I call for her softly. blasting its horn destroys sleep. We are dimly aware. I dream I must leave a stray cat by the road. I need a friend in this Southern town. are out of work like me. I walk slowly but keep moving on. played in our bedroom. The announcer goes on and on. We lie in bed and Linda moves closer to me. spoken to my son. I am resting up for a job interview. Linda will be back soon with cake and candles. person was me, once upon a time. Light is growing in the trees. embraced solitude, but speak to a stranger. we approach the city, headlights zoom everywhere. Angel sleeps in the back seat. She has been good. ocean swirling, on the edge of Charleston. Cousin Faye, after thirty years. what is in my heart. 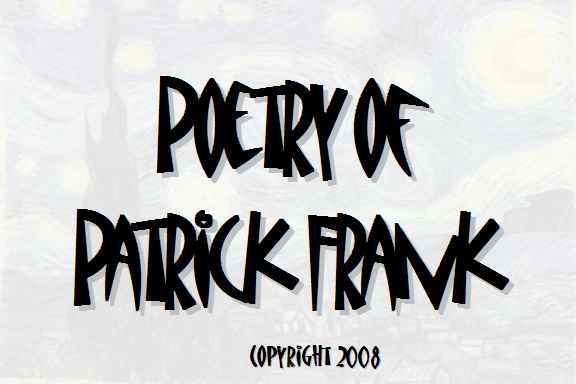 Copyright 2008, Patrick Frank. © This work is protected under the U.S. copyright laws. It may not be reproduced, reprinted, reused, or altered without the expressed written permission of the author. Patrick Frank is a Master's level teacher-counselor, poet-essayist, and advocate for the poor from Kingstree, South Carolina. My poetry and prose have been published in a number of periodicals and anthologized three times. Currently, he's teaching homebound students, while working as a grassroots organizer in the campaign of Barack Obama.